Robert Zemeckis' latest movie is officially one of the biggest bombs of 2019. 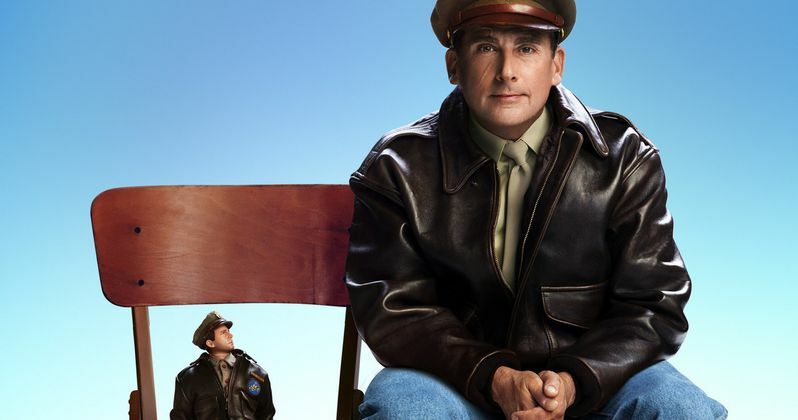 Welcome to Marwen, the ambitious real-life story that stars Steve Carell arrived in theaters with a thud over the weekend, debuting to just $2.4 million. Considering the movie's $39 million production budget, which doesn't account for marketing or distribution costs, it's going to cost Universal Pictures a big chunk of change. According to a new report, several insiders at rival studios expect that Welcome to Marwen will lose around $50 million. The movie, which is based on the documentary Marwencol and centers on Mark Hogancamp, a man faced a brutal assault and aided his own recovery by creating a miniature WWII-era village filled with action figures, opened on nearly 2,000 screens. The $2.4 million opening ties it for the worst opening for a wide-release in 2018, alongside Johnny Knoxville's Action Point. However, that movie only had a $19 million budget and a smaller marketing push. Plus, it didn't have the benefit of an A-list star and director. For Robert Zemeckis, this is the latest in a series of defeats at the box office. His WWII thriller Allied, which starred Brad Pitt, was also a bomb and his real-life drama The Walk, which was also inspired by a documentary, Man On Wire, failed to meet expectations as well. The only hit Zemeckis has had in recent years was Flight, which earned Denzel Washington an Oscar nomination for Best Actor. However, a key difference with Welcome to Marwen is that critics have not been kind to it. As of this writing, the movie carries a 25 percent approval rating on Rotten Tomatoes. With the poor response and the opening weekend bomb, theaters likely won't keep the movie on too many screens for very long. For Universal Pictures, this is their second major bomb in just two weeks. Recently, the Peter Jackson-produced $100 million blockbuster Mortal Engines, which was seen as a hopeful franchise starter, tanked as well and is also going to lose the studio tens of millions, with some estimates putting it as high as $125 million loss when all is said and done. Luckily for Steve Carell, he's also starring in Adam McKay's Vice, which has been earning rave reviews and recently racked up a bunch of Golden Globe nominations. So he's probably not going to hurt quite as much in the long run from this disaster. Universal has had big hits elsewhere this year, such as Jurassic World: Fallen Kingdom, which made $1.3 billion at the box office, in addition to The Grinch and Halloween. It's unfortunate for Robert Zemeckis, who is responsible for classics such as Back to the Future and Forrest Gump. Over the last handful of years, he's proved himself to be a bad bet and studios may not be willing to put up with that kind of risk in the future. This news was previously reported by The Hollywood Reporter.